Pharmaceutical Name: Radix Lithospermi seu Arnebiae. Botanical Name: 1. Lithospermun erythrorhizon sieb. et zucc; 2. Arnebia euchroma (Royle Johnst); 3. Macrotomia euchroma. Common Name: Lithospermun root, Arnebia root, Groomwell root. Part Used & Method for Pharmaceutical Preparations: The roots are dug in spring or autumn, dried in the sun, soaked in water and cut into slices. 1. Incomplete expression of rash in measles due to toxic heat in the blood: Arnebia (Zicao) is used with Cicada slough (Chantui), Arctium fruit (Niubangzi). 2. Maculopapule in febrile disease: Arnebia (Zicao) is used with Red peony (Chishao), Moutan bark (Mudanpi), Honeysuckle flower (Jinyinhua) and Forsythia fruit (Lianqiao). 3. Prevention of measles: Arnebia (Zicao) is used with Licorice root (Gancao). 4. Boils, carbuncles, burns and injury due to cold: Arnebia (Zicao) is used with Chinese angelica root (Danggui), Dahurian angelica root (Baizhi) and Dragon's blood (Xuejie) as an external application in the formula Shengji Yuhong Gao. 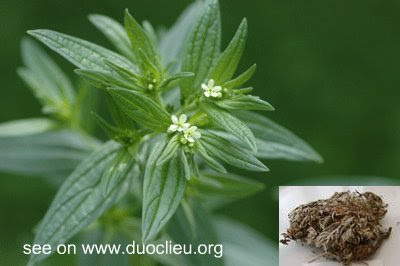 Cautions & Contraindications: This herb is contraindicated during weakness of the spleen accompanied by diarrhea.